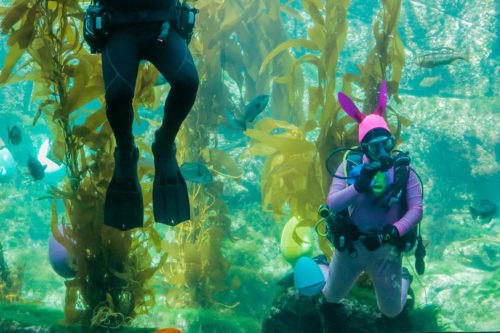 LA JOLLA–Scuba Bunny is returning to Birch Aquarium at Scripps Institution of Oceanography, UC San Diego to welcome spring and the changes it brings at Eggstravaganza. Families are invited to participate in unique spring activities including unusual animal egg displays, crafts, a scavenger hunt, and special appearances by Scuba Bunny at themed dive shows. Guests can join the celebration on Saturdays and Sundays, April 13 and 14, and 20 and 21, from 11 a.m. to 3 p.m. Scuba Bunny will hop in for twice-daily weekend shows, where he will interact with guests, talk about spring changes in our local waters, and be available for photos. Visitors are encouraged to check the schedule for dive show times and to arrive at least 20 minutes early for these popular events. Visitors of all ages will enjoy seasonal decor as they search the aquarium for eggs hidden among the fishes on a scavenger hunt with a colorful prize. Swell Sharks are the stars for the shark-egg craft. Many locals will recognize these unique “mermaid’s purse” eggs from exploring the shoreline. Guests will also get hands-on with eggs from different marine creatures and learn what it takes for them to survive until hatching in the oceans. Eggstravaganza activities are included with Birch Aquarium admission, which is $19.50 for adults and $15 for children ages 3 to 17. Annual memberships are also available. For more information or to purchase tickets, visit aquarium.ucsd.edu or call (858) 534-FISH.